It's a heist! 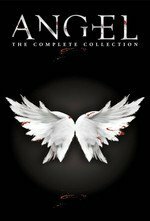 Angel takes the place of another vampire on a crew that's stealing the titular Shroud, which has the power to make everyone around it insane. The crew predictably kills each other, and Angel gets his first taste of human blood in a while when he bites Kate. This episode is a break from the Darla story arc that doesn't end up adding much to the season, but does feature horror icon Tony "Candyman" Todd as Vyasa, demon muscle. I like it better when the shroud does it here than when Loki's staff does it in Avengers. Also... I hate how Angelus is never really threatening for the rest of the series. He's a threat within his story arc, but his demeanor, which I've read was often improvised by David Boreanaz, was too much like Angel as Jay-Don here: quick to anger and a bit of a creep but mostly just a loudmouth chucklehead.